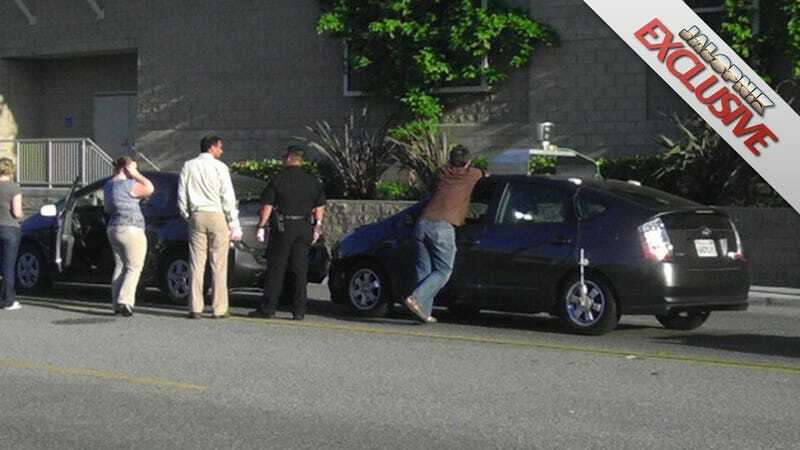 This photo of what looks like a minor case of Prius-on-Prius vehicular violence may actually be a piece of automotive history: the first accident caused by Google's self-driving car. Whose name should the cop write down on the ticket? UPDATE! Sent in by a Jalopnik tipster, the photos were snapped earlier this week near Google's Mountain View, Calif., headquarters. The Prius — recognizable as a Google self-driving prototype from the roof equipment that's smaller than a typical Google Streetview image collector — appears to have rear-ended another Prius. This is precisely why we're worried about self-driving cars. Perhaps the complicated set of lasers and imaging systems that Google chief autonomous car researcher Sebastian Thrun called "the perfect driving mechanism" thought it was just looking at its shadow. Earlier this year, Google convinced the state legislature of Nevada to create a special license allowing self-driving cars on the state's freeways, and its been racking up hundreds of thousands of miles in California, where there's no law banning them. Are Google&apos;s Driverless Cars Legal? Yet Google has never answered the question of who's ultimately responsible for any accidents that happen while the software controls the vehicle. There's a driver in all of Google's tests who can take control, and probably gets the ticket in this case — but Google imagines these vehicles spreading far beyond its corporate campus. Google can't be hoping to have its software legally blamed for a slice of the traffic crashes that cost more than $160 billion a year in this country. Yet if the operators of Google's self-driving cars retain all legal responsibility, simply turning the system on would be seen in court as a sign they weren't paying attention. Already some of the more forward-thinking technologists have questioned whether autonomous vehicles should be smart enough to sacrifice its own passengers to save other people in an imminent crash. Aside from promising the worst of a "Blade Runner" future, such thought experiments illustrate why self-driving cars will require such a huge conceptual hurdle to catch on in the United States. The biggest battle in auto safety today involves keeping drivers focused on driving. Google's self-driving car seems like the ultimate distracted driving machine. UPDATE: The boys at Business Insider received the following quote from a Google spokesperson about the accident: "Safety is our top priority. One of our goals is to prevent fender-benders like this one, which occurred while a person was manually driving the car." Of course, how would we actually know whether it was being manually driven at the time? Now that we've got confirmation that this was one of Google's self-driven cars, it's high time we got a closer look at the details of how they're trying to make it happen — and any evidence that this actually was being driven by a real, live human being. Striking a car with enough force to trigger a four-car chain reaction suggests the Google car was moving at a decent clip. Google says it's unable to provide us with a copy of any official accident report, but that may be the only way to know what happened for sure. Hat tip to El Phreak!